My number one healthy habit that keeps me focused on my week, would have to be meal planning. I cannot stress the importance of this habit enough. It is extra important when our lives get busy with unexpected tasks. It is so much “easier” to just order takeout after a long, stressful day, than to figure out what to make in that moment. It is “easier” to just skip dinner and eat whatever is in the house or go out to eat. However, these little decisions add up to big habits that are hard to break. Plus, our health and our wallets suffer as well. So what do we do? Start by first asking yourself why you want to make a change in your meal planning. To save money, to be healthier, to make weeknights less stressful? When you have a ‘why’ it makes it easier to tough it out and just make dinner than to give in and order takeout. Next, write it out! Again, this is a critical step. Set a ‘meal planning’ time. Then set a grocery shopping day. Finally, a meal prep day. This alone will set you up for success. There’s something about writing things out that gets the job done. Once these dates are written down, start meal planning! Figure out your week. “Okay so Monday we are eating with our parents, Tuesday I have a meeting late at night so that will be a take-out day, Wednesday I will cook…” This creates a pre-plan on paper the dinners you decide to cook. If you need more guidance on how and what to eat, Impulse’s Nutrition Impact class is perfect for you. Meal planning saves time in the long run, is cheaper, and will make your weight loss goals a whole lot easier. Courtney's mission in life is to share her gifts with other people, and to show them how great they can be. She feels beyond blessed for the moments shared with her clients over the years, and realizing nutrition is only a part of their journey. The counseling Courtney shares encompasses cognitive behavior therapy- making sustainable positive lifestyle changes and eliminating ‘diet approach’ thinking to eating. Her heart is full when clients discover parts of themselves they didn’t know were there. 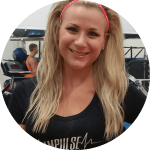 Courtney's educational background includes a Bachelor of Science in Nutrition and Dietetics from the University of Akron, completion of the Coordinated Internship Program through Akron, Certified Sports Nutritionist, and Certified Personal Trainer through the American Council on Exercise.